By Kiannah Sepeda-Miller on Sunday, November 11th, 2018 at 3:00 p.m.
At a City Club of Chicago appearance, lawyer and lobbyist Gery Chico said "there is no more top priority" than public safety. Chico, who has chaired both the Chicago and state boards of education, called for a return to community policing and stressed the need to ensure officers are properly trained and resourced. "There are no excuses for someone shooting someone … Those people have to be aggressively prosecuted and they have to be punished for their actions," Daley said, suggesting there should be some sort of "outrage bill" from lawmakers in Springfield in response to the violence. "Better policing can’t be the sole solution to the challenge these communities face," said Preckwinkle, just re-elected to her county post. Like another potential candidate, former Chicago Police Board President Lori Lightfoot, Preckwinkle argued gun violence should be addressed as a "public health crisis." "This is, next to crime, the single biggest issue that the city’s got to deal with," Daley said in his WLS interview. "And it’s not going to be solved simply." Daley made it clear, however, that he isn’t suggesting raising property taxes to manage the increase. "If you do that, they will leave," he said, referring to city residents. "I’m not going to impulsively hit the gas pedal on property taxes," Chico told his City Club audience, suggesting the city first seek out new revenue streams such as one that could come if Illinois legalizes the sale of marijuana for recreational use as have 10 other states. 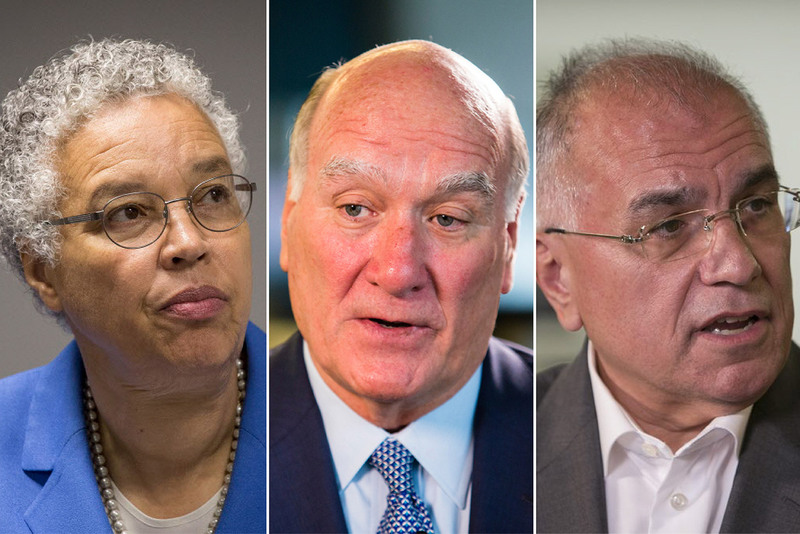 Beyond pensions, school performance has been another hotly debated topic among mayor hopefuls.